And so kindly he granted his daughter Bessie. And kindly beloved was pretty Bessie. If you will but love me, my pretty Bessic. Or where do you live, or whence do you come ? The Blind beggar's daughter of Bethnal Green. So scornful he turn'd from pretty Bessie. If you will but love me, my pretty Bessie. If you will drop guineas, I'll do the same. Was the blind beggar's daughter of Bethnal Green. Adieu ! a heart-warm, fond adieu ! by John Livsey, 43 Hanover-Street Shudehill, Manchester. 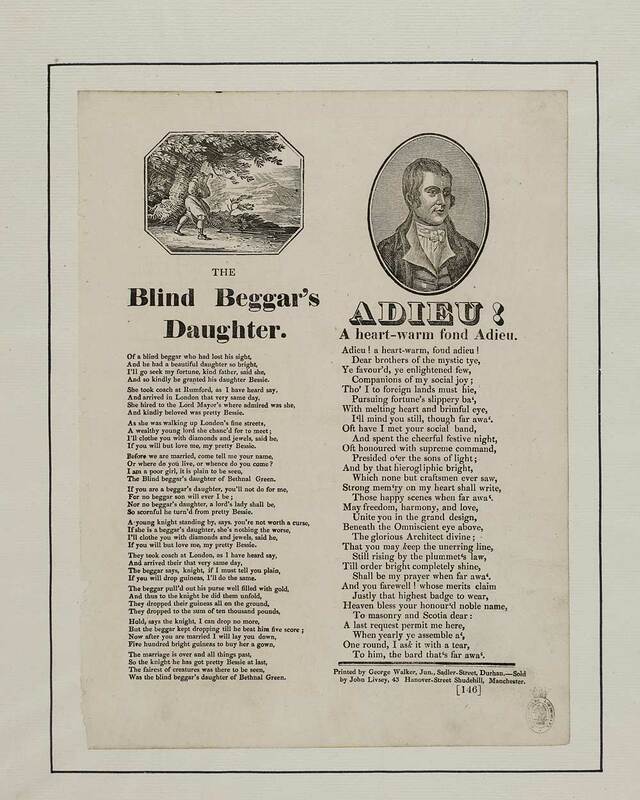 The blind beggar's daughter - first line reads: Of a blind beggar who had lost his sight. Adieu! A heart-warm fond adieu - first line reads: Adieu! a heart-warm fond adieu.